If you are like me, you may have noticed your skin getting really dry, cracked or chapped. If so, you can blame the weather. 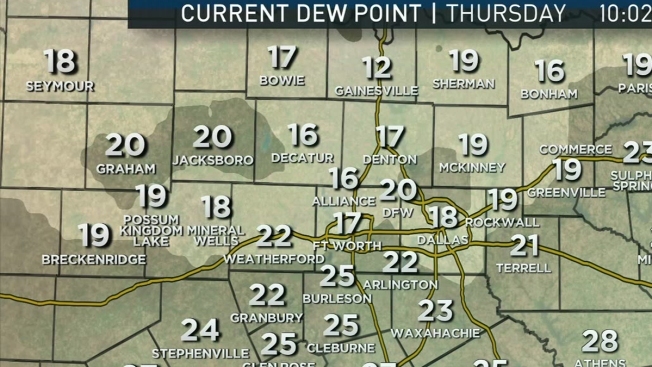 North Texas is experiencing its coldest air in nearly two years. The air will also be very dry, with dew points dropping into the teens. The dew point temperature basically measures how much moisture is in the air. It is the temperature in which the air can no longer hold all the water in it, resulting in saturation. When you know what the dew point is, you can more accurately measure humidity and your comfort level. The relative humidity can change as the temperature changes, but the amount of moisture in the air will not (unless a new air mass moves in). In the summer months, when you see a dew point in the 60s or higher, the air will feel very humid. In the winter, dew point in the 30s or lower is when you will notice your skin getting very dry. The air in your house will also be very dry this time of year. When you turn the heat on, all the moisture in the air dries up. You can use a humidifier, if the dry air bothers you.